More likely than not, you know the name Charles Schwab. The San Francisco-based bank and brokerage is recognizable across the finance world, having forged its reputation over the years from a blend of institutional expertise and client-first accessibility. To many investors, Schwab’s services are synonymous with financial maturity and dependability. Like other robo-advisors, Schwab Intelligent Portfolios give investors cost-efficient access to the sort of complex investment management once available only through expensive, expertly directed services. Schwab Intelligent Portfolios are also unique for their zero fees (well, nearly zero — investors still pay fund-level costs), direct access to the company’s institutional knowledge, and the wide spectrum of assets available to the Portfolios through ETFs. To some investors, Schwab Intelligent Portfolios might appear to be one version of a complete package. That’s almost true. There’s one significant ingredient Schwab Intelligent Portfolios do not offer: private market real estate — the kind of private market real estate that has helped institutions like the Yale Endowment outperform otherwise comparable investors year after year… the kind of private market real estate now available to anyone, through Fundrise. In this article, we’ll look at why Schwab Intelligent Portfolios and Fundrise Portfolios are powerful complementary tools that, when used together, offer investors an efficient, cutting-edge way to construct an investment strategy diversified across a range of asset types, so as to maximize potential returns and consistency, at minimal cost. Schwab Intelligent Portfolios may be automated, but they successfully feel both personal and expansive at the same time. Schwab Intelligent Portfolios invest in their full spectrum of assets exclusively through 53 pre-selected Exchange Traded Funds (ETFs), culled from an original array of over 2,000 by Schwab’s internal team. Each of these ETFs represents broad exposure to an asset class, and, inversely, each asset class in which an Intelligent Portfolio invests can be accessed by two different ETFs, one primary and one secondary. In other words, Schwab Intelligent Portfolios have access to 27 different asset classes, with two ETFs available in each asset class (with the exception of Bank Loans, under which the Invesco Senior Loan ETF is the only option). Screenshot taken from Schwab’s pages. And if you look at the bottom couple lines in the image above, you’ll even see exposure to public REITs — that is, public real estate investments. But not all real estate is the same. While Schwab investors can find benefits in their Intelligent Portfolios offering some exposure to real estate, it’s crucial to note that the real estate investments underlying those shares are — by virtue of their being bundled in an ETF — at the mercy of the public market and the whims of a public trading them with the full costs of liquidity. They’re sold as shares that are subject to daily fluctuations and limited in their true diversification potential. The bottomline? The REIT ETFs offered through the Schwab Intelligent Portfolios have a potentially high correlation with the rest of the public market and they’re subject to the same kinds of hidden fees of inefficiency that we revealed in Vanguard’s REIT ETF. Ultimately, these qualities mean that the real estate available to the Intelligent Portfolios have critically different characteristics from the private equity real estate investments available through Fundrise, which are not at the mercy of the behaviors of the public market. Some of these significant differences include the real estate’s volatility, risk/return profile, and beta. The potential diversification and overall benefits offered through the Schwab Intelligent Portfolio REIT ETFs are considerably weaker than those available through private market real estate — essentially a different asset class overall. As a result, the full potential of a Schwab Intelligent Portfolio on its own is significantly weaker in comparison to an analogous investment strategy that also uses real estate private equity — like that available through Fundrise — to tap into a kind of investing brand new to many investors. For years, investors have been instructed to follow a few investing rules of thumb particularly in regards to how investing in a variety of asset classes can maximize returns. The most famous roadmap is Modern Portfolio Theory, which dictates that you should invest in a mix of stocks and bonds. This is a good start, but is grossly oversimplified and outdated when examined in an environment as rich with varied options as today’s. As we’ve written about in our discussions of Bringing Portfolio Theory Into the Age of the Internet, there are two huge issues with the old standard of Portfolio Theory. It doesn’t prioritize the benefits of going beyond the public market, like lower volatility and potentially outsized returns: Modern Portfolio Theory is built on the assumption that average investors may only be able to invest in the public market. Following that assumption, those who remain strictly in public investments don’t seek out those lower beta opportunities that can be found in the private market, or even those opportunities that look to take advantage of the inefficient pricing of private market investments, which can lead to better performance overall. Of course, it’s important to note that Schwab Intelligent Portfolios go far beyond this kind of simplicity, with their expansive options of ETFs and asset classes, and their powerful technology that drives everything from portfolio rebalancing to tax harvesting. However, their lack of private equity means they still haven’t taken a crucial, final step in diversifying their clients’ investment strategies. And why does that matter? It’s pretty simple: the private market holds unique potential for better, and more consistent, returns. There’s actually also a pretty simple reason why Schwab wouldn’t include direct access to private market real estate among its robo-advisor’s offerings: it takes a lot of dedicated work and specialized skill sets to find, fund, manage, properly value, keep track of, and offer high-quality real estate investment opportunities. To build a portfolio that taps into the genuine value of the private market, you have to find a way to expand your portfolio beyond the stock market (and the public market at large). In the past, this has often meant individually buying an entire home, or becoming a landlord, via the private real estate market. But now, for the first time ever, you can invest in multiple million-dollar real estate deals without writing million-dollar checks. That’s what Fundrise does, and that’s why, alongside Schwab Intelligent Portfolios, it can help investors build a more perfect portfolio. Fundrise provides unique access to private market real estate. Schwab Intelligent Portfolios have the potential to offer all the more traditional ingredients, but Fundrise private market real estate is the key that can open old portfolio construction to a new world of diversification and potential performance. Schwab Intelligent Portfolios stand out among other robo-advisor offerings for having a $0 advisory fee. While investors still have to pay their ETFs’ operating expenses,4 Schwab’s dedication to eliminating superfluous costs is something they have in common with Fundrise. For investors interested in establishing a portfolio with extraordinarily low advisory costs, Schwab Intelligent Portfolios and Fundrise make a powerful pairing. One of the most common criticisms of the Schwab Intelligent Portfolios is their tendency to allocate a relatively high percentage of the investor’s funds to cash.5 The issue here is that the invested dollars are sitting stagnant, not earning potential returns, a concept known as cash drag. Some investors would even say that these high uninvested cash portions are tantamount to an unidentified fee. However, this characteristic can actually help foster a more complete, balanced investment strategy when placed in the same portfolio as a Fundrise investment. 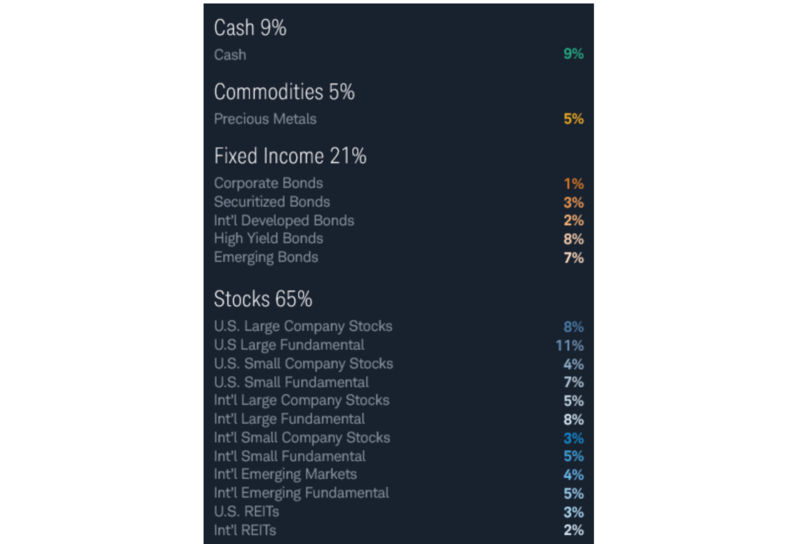 First of all, when Fundrise is added alongside a Schwab Intelligent Portfolio, by increasing the overall exposure of the portfolio, it helps mitigate the overall percentage of cash in regards to the overall portfolio. More uniquely though, Fundrise and Schwab Intelligent Portfolios can help balance out an investor’s overall liquidity, with Fundrise’s 5-7 year investment horizon acting as a ballast to the extreme liquidity provided by the cash allocated by Schwab Intelligent Portfolios. Both Schwab Intelligent Portfolios and the Fundrise investor dashboard feature robust investor goal tools, which help users pinpoint and pursue exact financial targets, based on their initial funding, projected performance, and planned contribution schedule. As their investments grow, these dashboard features tell the investor whether their current performance is progressing toward meeting their identified goal, or if they need to add more funds to stay on track. Like Schwab Intelligent Portfolios, Fundrise investments are designed to help investors tailor their portfolios to their particular financial goals, even if the investment’s anticipated conclusion is still years away. And because both products feature their goal-achievement tools similarly, it should be easy for an investor to construct their total portfolio toward reaching a shared, united target. Schwab’s entry into the high-tech world of robo-advisors is an impressive showing, especially among tech innovations from other major firms — its Intelligent Portfolios offer quite good diversification, zero fees and commissions, personalized goal setting, and the institutional support of one of the most well-respected brokerage companies in the world. 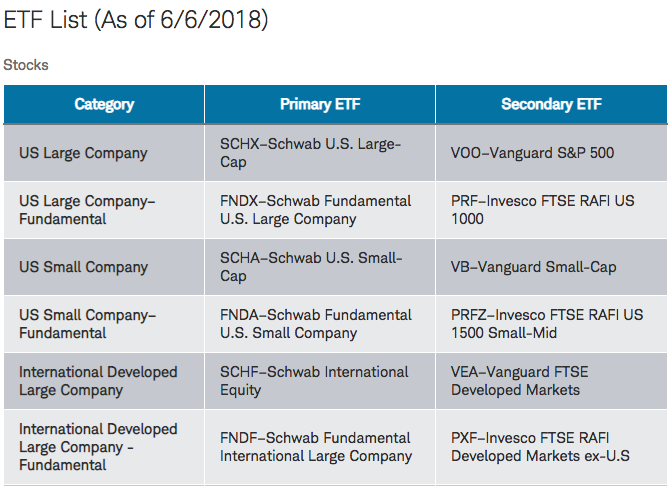 The 53 ETFs Schwab uses promote wide diversity and the potential for granular portfolio composition… with one major exception: private market real estate. That’s where Fundrise and Schwab Intelligent Portfolios can act as powerfully complementary tools. Fundrise can fill a major gap in Schwab’s robo-advisory offering — a gap that many investors may not even realize they should seek to fill, since private equity real estate hasn’t been a realistic or cost-effective option for many individuals in the past. Now, however, it is, and investors can start updating their expectations for what an optimized, minimally costed portfolio looks like. Strategically including private market real estate in the total makeup of an investment portfolio (even one that is smartly composed with the powerful logic of Schwab Intelligent Portfolios) can provide crucial benefits: lower volatility, outsized potential returns, and, in some cases, reliable, regular cash flow. With Fundrise, today’s investors have a powerful, tech-driven option for adding exactly that kind of private real estate to their investing strategy, elevating it beyond the limited allocations available through many otherwise sophisticated robo-advisor products — Schwab Intelligent Portfolios being just one example. While robo-advisors have given investors a new way to compose the kinds of portfolios recommended for decades, Fundrise offers the opportunity to use institutional-quality real estate assets, unparalleled transparency, and minimal costs to transform those portfolios altogether. Fundrise and Charles Schwab are not affiliated in any way, and the opinions expressed herein are solely those of Fundrise. The statements and opinions contained herein are not investment advice and are for informational purposes only. All investing includes risk, including risk of total or partial loss, and investors should speak with their individual investment and tax advisors before pursuing any investment strategy. “Charles Schwab”, “Schwab”, and “Schwab Intelligent Portfolios” are registered trademarks of Charles Schwab & Co., Inc.
Why we charge fees at all, how we save you money, and why this is the future of real estate investing.